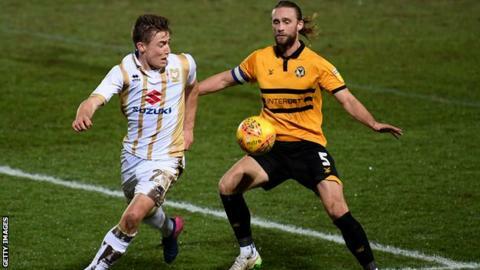 Newport County defender Fraser Franks says he is "devastated" at being forced to retire on medical advice because of a heart problem. Doctors will not clear the 28-year-old, who captained the League Two side in their FA Cup victory over Leicester City this season, to resume his career. He spent a week in hospital because of an irregular heartbeat and was unable to train as a result. Franks says he is hoping to "remain in football in some capacity." He has made 34 appearances for the Exiles this season, having joined the Welsh side from Stevenage in 2018. Franks played 320 games in his career, but he has not featured for Newport since 19 February, though he did come on as a substitute against Pep Guardiola's Manchester City. He has also played for AFC Wimbledon, Welling United and Luton Town. Newport manager Mike Flynn said: "He's a great lad and somebody that I tried really hard to bring to the football club because I knew he was such a good leader and player. "I'm absolutely devastated for him personally, and it's a big blow for the team as well. "He knows I'm always going to be there for him... he's been fantastic for us but the most important thing is his long-term health." In a statement Newport said they were doing everything to support Franks and his family and that there would be further announcements in the coming weeks. Franks is expecting his first child in the coming weeks with his pop star wife Stacey McClean, who was a member of S Club 8 and appeared on the sixth series of X Factor. He scored in his last appearance, a 4-1 win at Notts County. Hard to find the words at the moment but obviously devastated to have to announce my retirement from football. After becoming ill last month and spending a week in hospital I underwent a number of scans and tests on my heart. Cardiologists found an issue with the heart and I have been forced to retire from football. I've had various second opinions and it's clear that I will have to take the medical advice and unfortunately call time on my playing career.